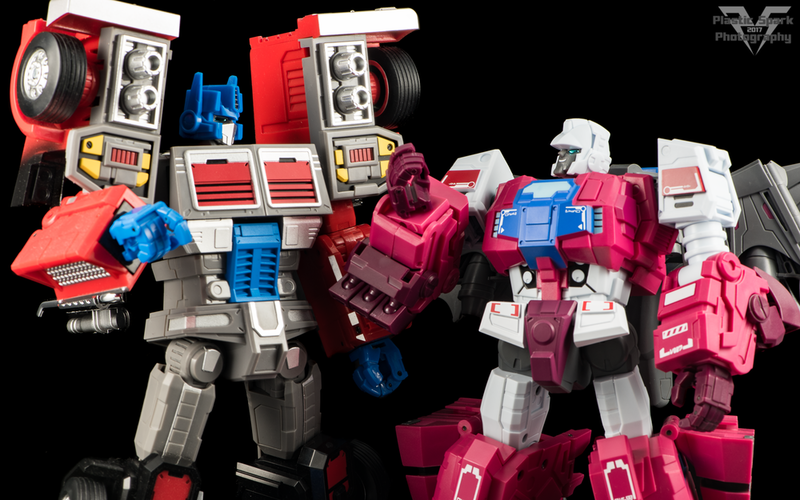 Fans Hobby’s MB-05 Flypro has now completed a trio of characters that Masterpiece collectors never thought they would see on their shelves. 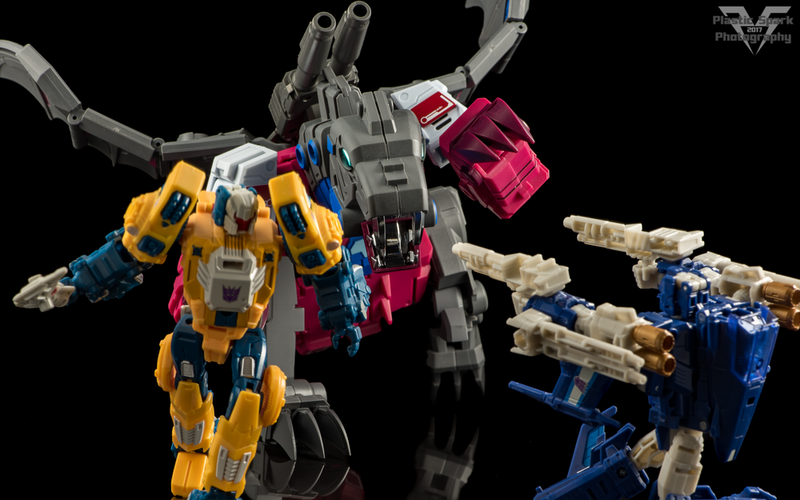 The Monsterbots are such a strange group but Fans Hobby has stuck to their guns and finished the trio of beastly bots for our MP collections! 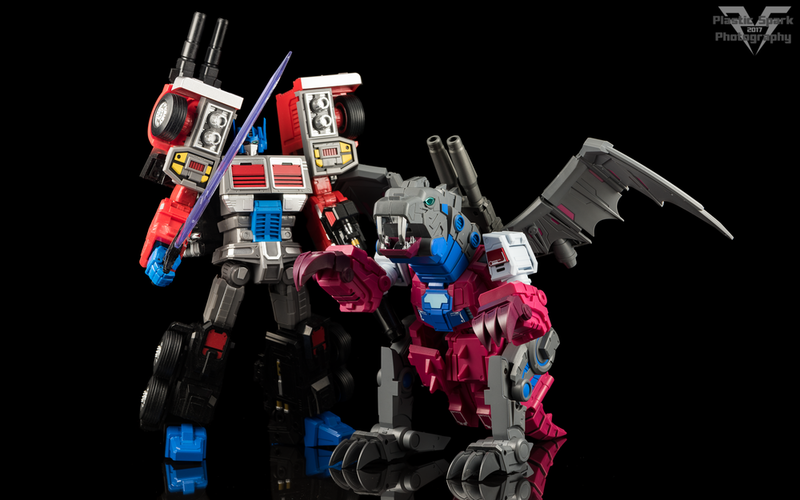 Flypro is their interpretation of the G1 Monsterbot; Grotusque, and one hell of a toy in hand. Fans Hobby were very kind to reach out to me and provide me with this production sample of MB-05 Flypro to photograph and review. Please keep in mind this is a production sample and while it does feel very near completion, some changes may be made before final release. 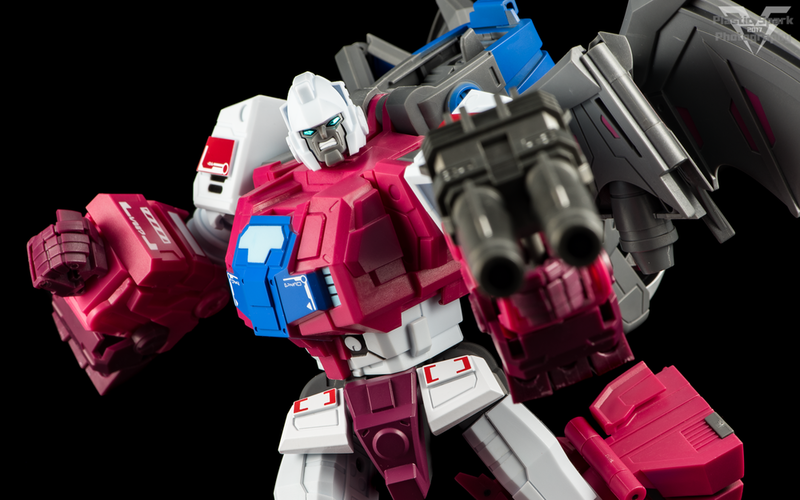 Flypro is currently available for pre-order from your retailer of choice or directly from Fans Hobby themselves with an estimated release window of June 2017! Now let’s get into the review and break him down! "It's me, Streetwise! 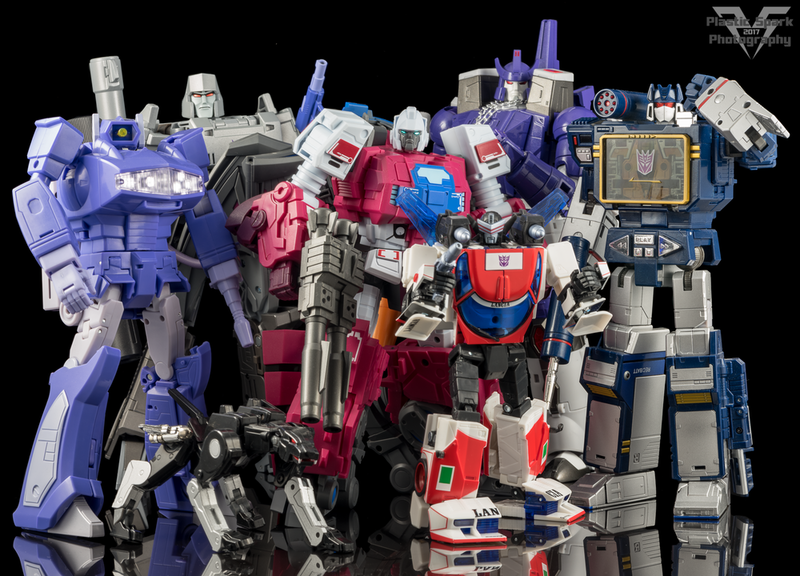 Protectobots form Defensor!!! Uhh… what the heck is this supposed to be?!? 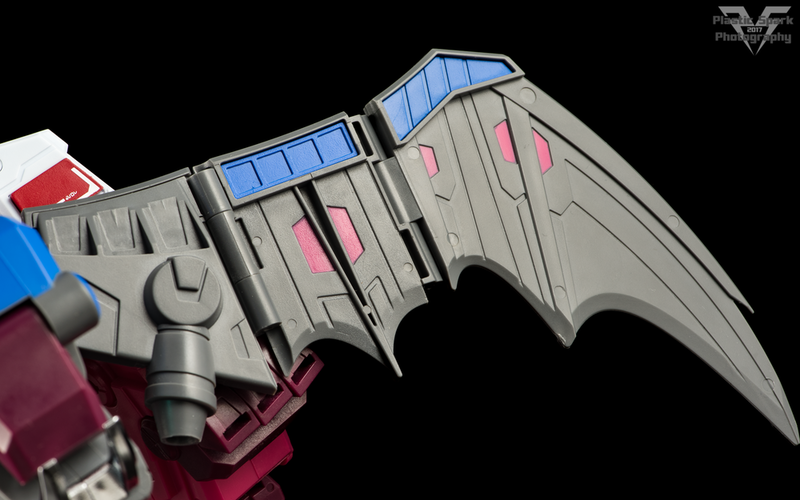 To be clear this isn’t a jab at Fans Hobby in the slightest, as they’ve done an excellent job of upgrading and recreating G1 Grotusque, it’s more of a statement on the original design. I’m not sure what Grotusque was ever supposed to be. Some sort of Dragon Gerbil? I’ve heard that he’s supposed to be a Sabertooth Tiger/Dragon. I suppose I could see that by looking at the general head/neck shape. So let's call him a Sabertooth Tiger Dragon for now. Don't use the acronym... trust me. 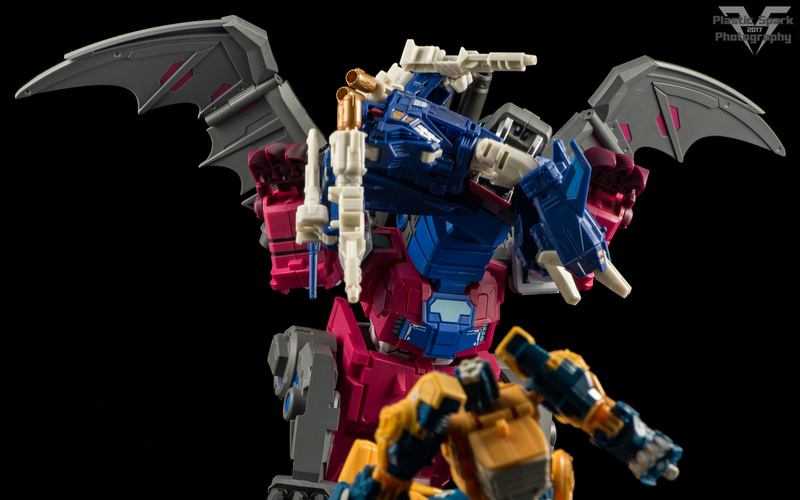 This is some absolutely weird source material to work with and just like with Megatooth (Repugnus), Fans Hobby has made the best of a strange situation by keeping the core elements of Flypro’s “beast” mode present and modernizing the design by covering him in a ton of mechanical detail, and all kinds of awesome robot dragon accoutrements. There’s something quite charming about the alt mode, he has a lot of personality and can be both ferocious, and also kind of cute in a ‘strange looking dog’ sort of way. "Grotusque, Stop scaring the mini bots! Ratchet is getting tired of resetting their panic switches!" Flypro has some impressive articulation in beast mode. Here’s the breakdown. The head is on a large ball joint allowing for a small amount of up/down and left/right movement as well as rotation. He’s also got a hinged jaw which really helps add a lot of expression to him, as well as allowing for the included fire effects to be used! "Triggerhappy, keep shooting, it's useless to, stop charging, he will not!" The wings are mounted on a swivel at the base allowing them to swing forward and back. There are also multiple hinges in the wings themselves to accommodate various mid flap, outstretched, and even tucked away positions. This allows for a large range of articulation and personality to be expressed through the wing position. The wings can also fold in accordion style if you prefer them closer to the body. "Told you so, I did Triggerhappy." His arms are really just his robot mode arms so I'll be going over those later on in the review the only difference being the monster claws, each of which is on a ball joint with a fair range of movement. The legs have a swivel at the hips, and a ball jointed knee that is also used in place of an ankle tilt to keep his feet flat on the ground. Feet are partially die-cast and the toe and heel can both be adjusted independently, with the toe on a heavy ratchet joint. The knee ball joint is tolerable but slightly loose on this test sample so Flypro may tilt forward and fall on his face if his centre of gravity is too far forward. If this is a widespread issue then hopefully this can be tweaked a bit before final release, though it could be isolated to my copy. If you’ve handled Fans Hobby’s previous offerings you may notice that there are some shared components/engineering between Flypro and Feilong. You can see the similarities if the figures are viewed side by side but I feel like both figures set themselves apart really well through unique surface detail, color pallet and overall personality. In fact spending time with Flypro has really just solidified my decision to add Feilong to my collection as soon as I can find the opportunity. Flypro’s mostly pink dragon mode unfolds beautifully into a pink and white chunky brawler. 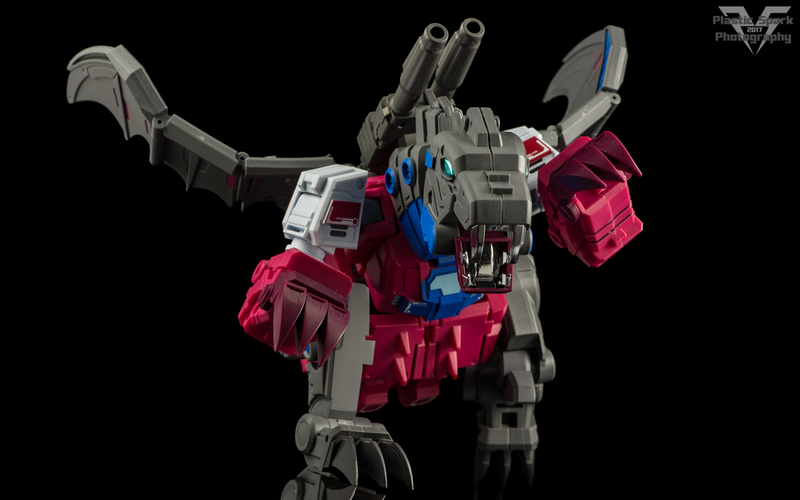 The transformation is simple and intuitive on the level of some of the more simple official Masterpiece figures, like MP Grimlock or Convoy, and very much on par with the transformation style of Gunfighter. 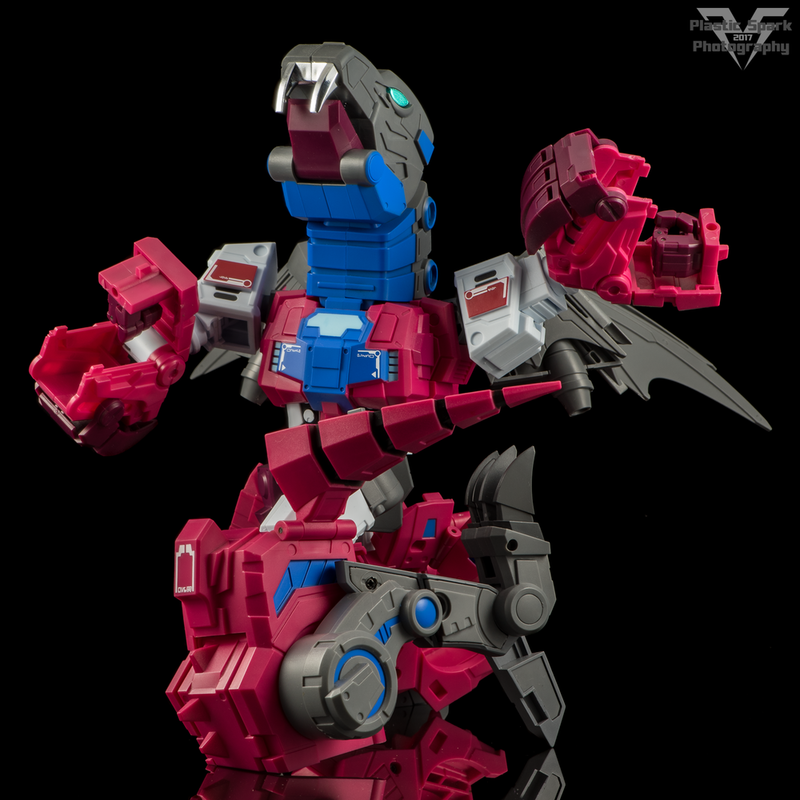 The transformation is easily solved without instructions for any veteran of transforming toy robots and the materials used are all sturdy and feel great to handle. Most of the work is done in the lower body and legs as the majority of the upper body is the same for both modes. Flypro has an incredibly pleasing color scheme to my sensibilities. I’m a big fan of the later G1 usage of colors like pink, teal, purple, and white. 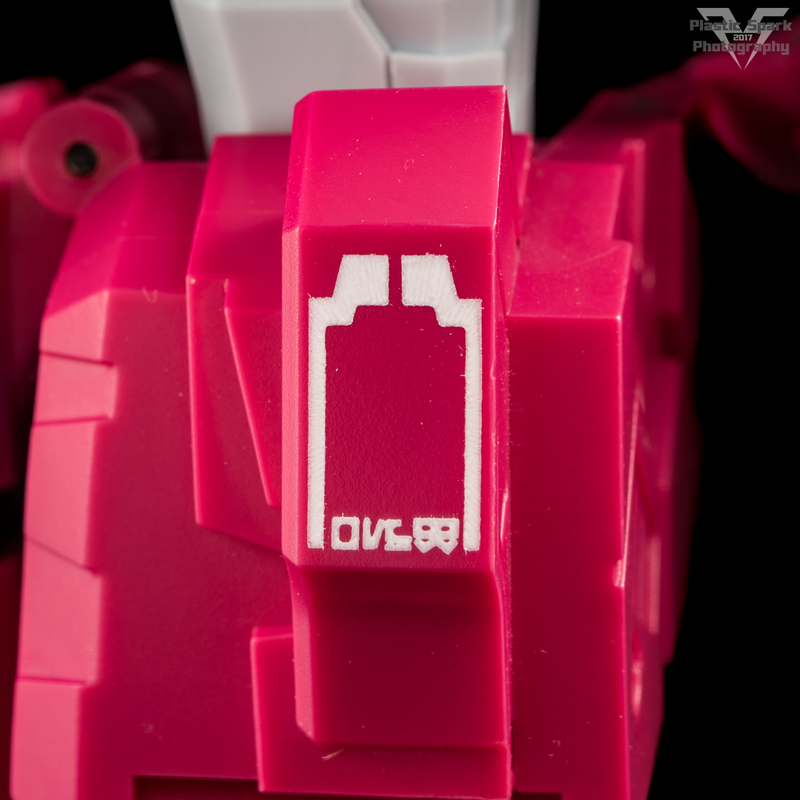 I also really love all the little details that Fans Hobby has added like the painted details in the wings and the small tampograph details all over the bot mode. They almost look like warning/caution signs on a Gunpla kit but written in an alien language. The whole bot mode absolutely screams G1 Grotusque with only the head/helmet area being a slight departure. It’s a bit more rounded but the same general design cues are still present. 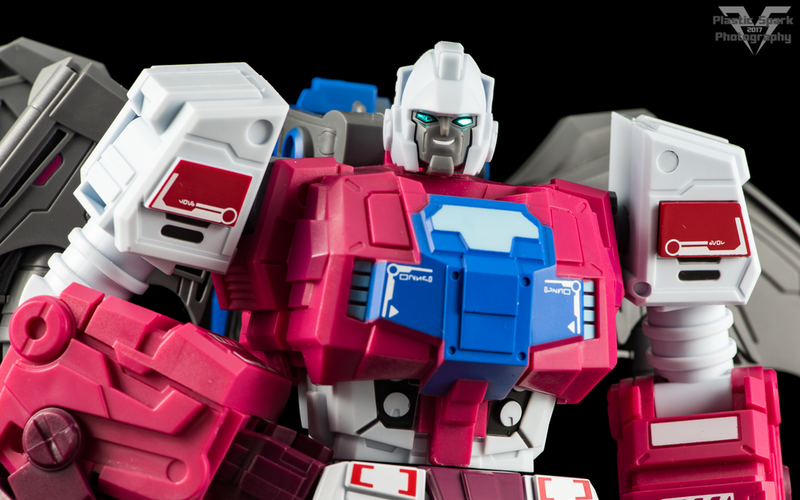 I think Fans Hobby did an excellent job in translating this character into a more modern design aesthetic. Articulation for bot mode isn’t anything remarkable but is certainly quite competent in its execution. From the top down we have the head on a ball joint with a full 360 degree rotational range, some head tilt and the ability to look down, but very little upward movement. 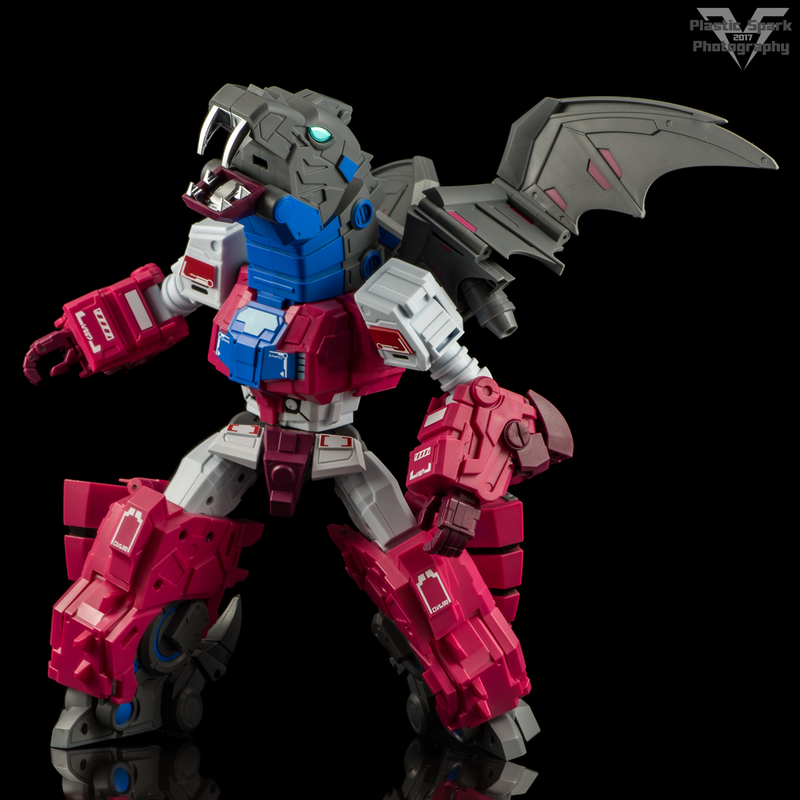 Shoulders are the same as alt mode with a ratcheted base hinge that can be used to adjust the shoulder line of Flypro, a friction fit universal hinge for outwards and forward/backward movement, bicep swivel, ratcheted elbow and wrist swivel. Due to transformation you can also adjust the fists inward/outward slightly which is actually useful for certain poses. Flypro’s hands are articulated in typical MP fashion with double jointed index finger and single jointed knuckle for the rest of the hand. We have a standard waist swivel, with ratcheted universal hips, thigh swivel, ratcheted knees that can bend to about 45 degrees due to transformation, and finally the feet, which have a modest tilt, as well as up/down adjustment on the toes and heel. 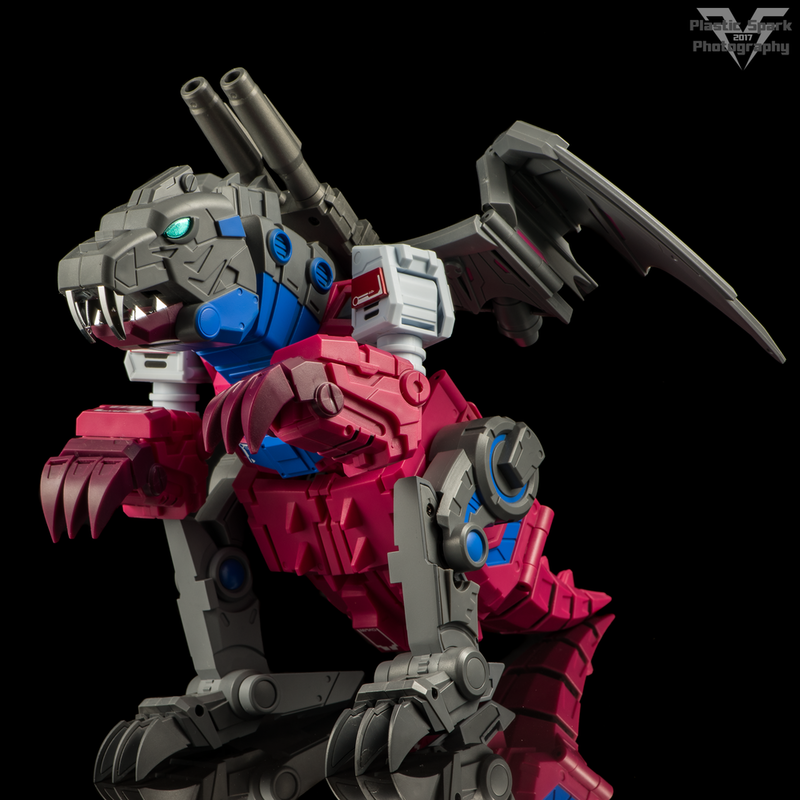 I would have liked to see a bit more range on the knees, at least 90 degrees would have been my preference but that would have required re-engineering the transformation slightly, and the lack of an ab crunch after being spoiled by MB-04 Gunfighter II is a bit of a bummer but not a deal breaker. 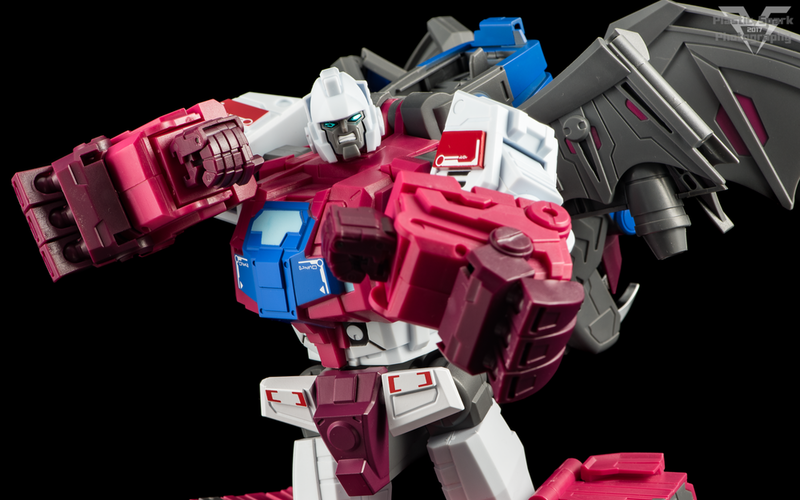 Flypro won’t be the most posable figure in your collection but he is more than capable of pulling off the kind of poses and stances you would expect from a gigantic monster bot. He’s an enforcer type rather than a more acrobatic flexible character and that shines through in everything that Flypro does. He looks powerful and intimidating, likely an unwanted sight on the battlefield for any Decepticon to run into. 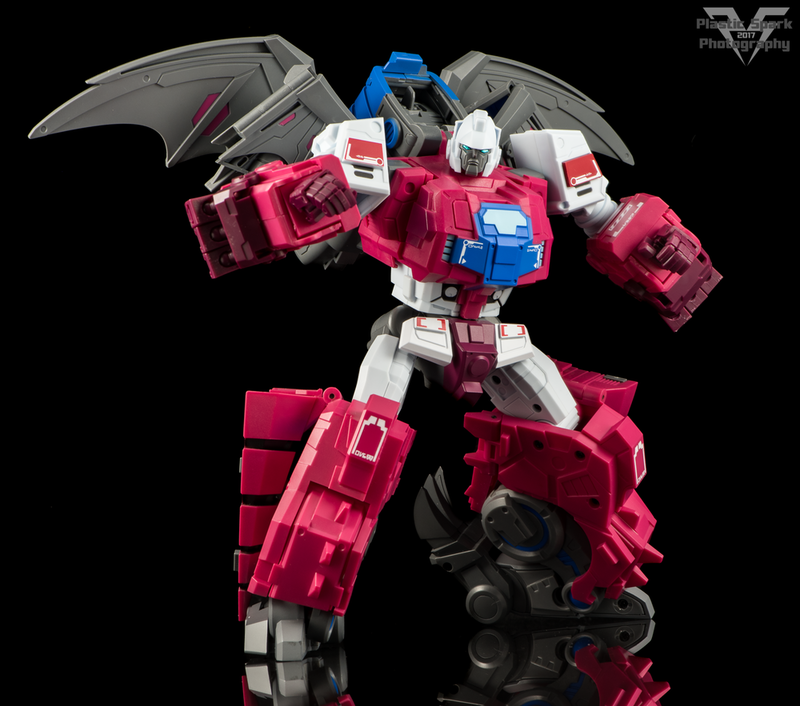 Fans Hobby went all out with the accessory kit on this guy including not only extra gear for Flypro, but also accessories for the other 2 Monsterbots in the line! There is a treasure trove of fun stuff packed in here! 1x Dual Blaster Cannon – Modelled loosely on the original G1 blaster included with Grotusque, this dual barreled firearm is molded in a dark grey plastic with a slight metallic sheen. It slides into the hand along a rail system similarly to MB-04 Gunfighter II and can also be pegged into Flypro’s back between his wings for alt mode storage. 2x Replacement Faceplates for Flypro – Flypro’s default expression can be swapped out with either of these 2 included faceplates. There is a grinning face and also a more serious combat face with his gritted teeth on display. I think all three faceplates look exceptional and I’m especially a fan of the angry one. 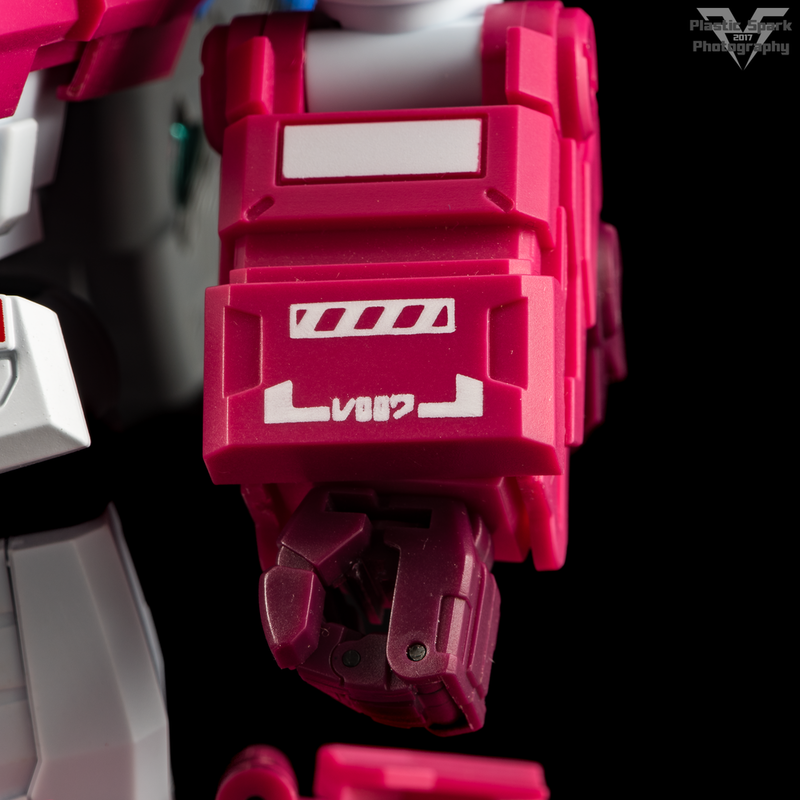 The faceplates are a fairly simple swap but they do require the head to be unscrewed. I am a bit disappointed that this couldn’t have been achieved with a peg on method similar to the new faces for Feilong but this seems to be a common method in the third party scene. 1x Accessory kit for MB-02 Megatooth – Two replacement faces are included for Megatooth as well as a replacement chrome visor. The faceplates depict a cocky smile as well as an angry expression. 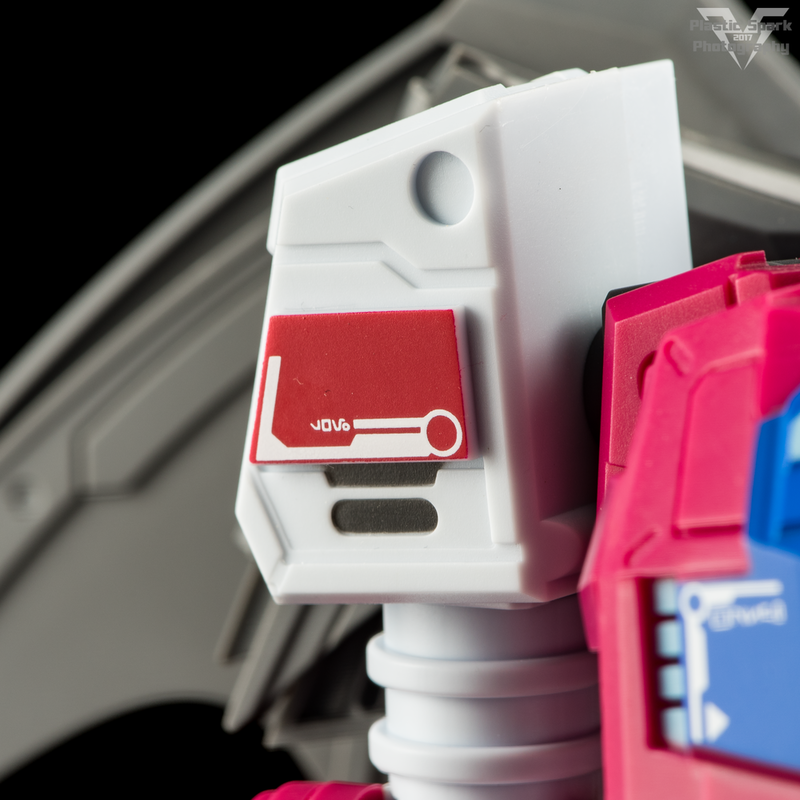 The chrome visor pegs onto the faceplate using the small triangular pegs visible where the eyes would be. 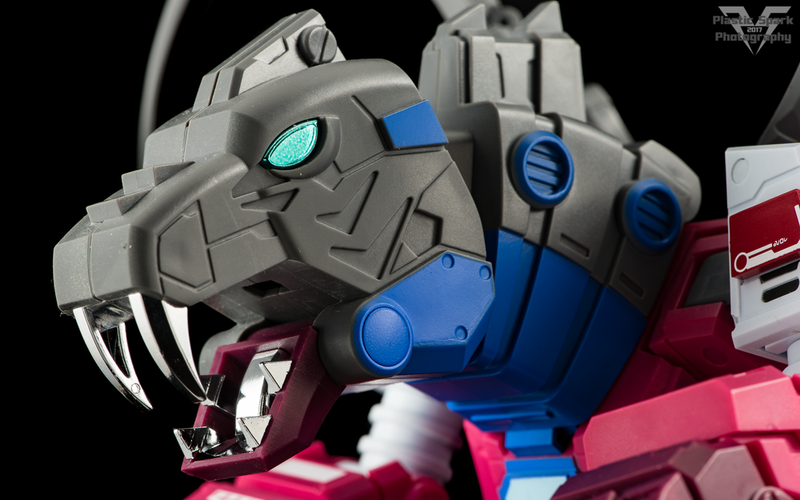 1x Accessory kit for MB-03 Feilong – A replacement helmet as well as 2 replacement face plates are included for Feilong to add a shouting expression or a smirk to his robot mode. The new helmet piece replaces the front portion of the existing helmet on Feilong in order to accommodate the faceplate gimmick. Also included are 2 articulated hands that can be pegged into the cannon ports inside of Feilong’s dragon mouths. I personally love the way Feilong looks with real hands so I’m very happy this was included as an option. 8x Fire Effects – This is one of the coolest accessories that I’ve seen included with a figure in a long while. 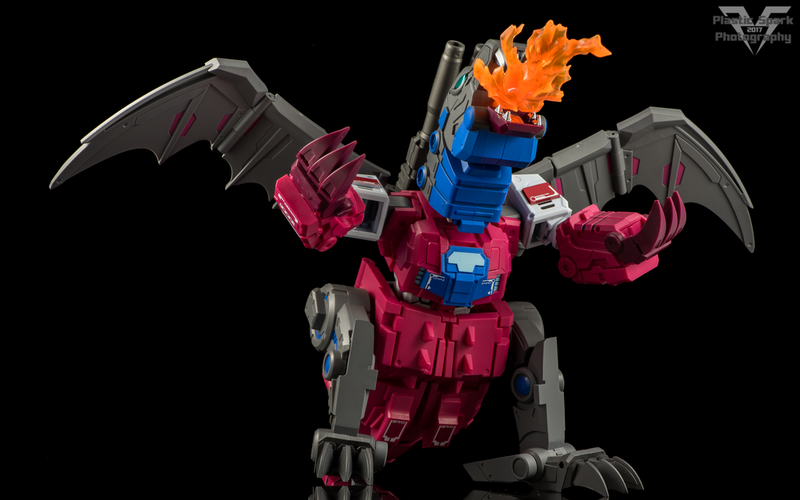 These 2 piece fire effects can be pegged into the mouths of the Monster bots to emulate their original G1 sparking gimmick! This is also a very welcome accessory for photographers as you can add great effects to your photos and displays without the need for digital effects! Fans Hobby could have included one of these effects with their final figure to be shared among the other Monsterbots but instead they chose to go the extra mile and include a full set of flame effects! 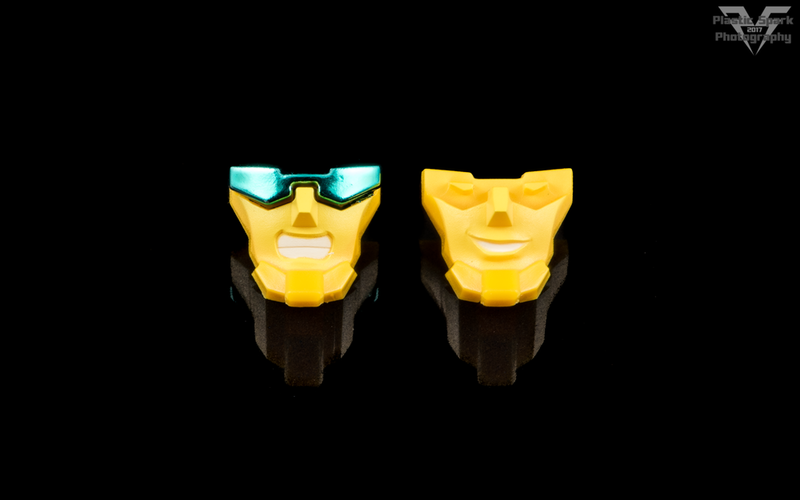 There’s enough here to equip every Monsterbot with flames erupting from their alt mode mouths including both of Feilong’s dragon heads! I didn’t know that to expect with Flypro as this is my first in hand experience with one of Fans Hobby’s Monsterbots. I’ve been meaning to pick up Feilong but the opportunity just hasn’t presented itself yet. 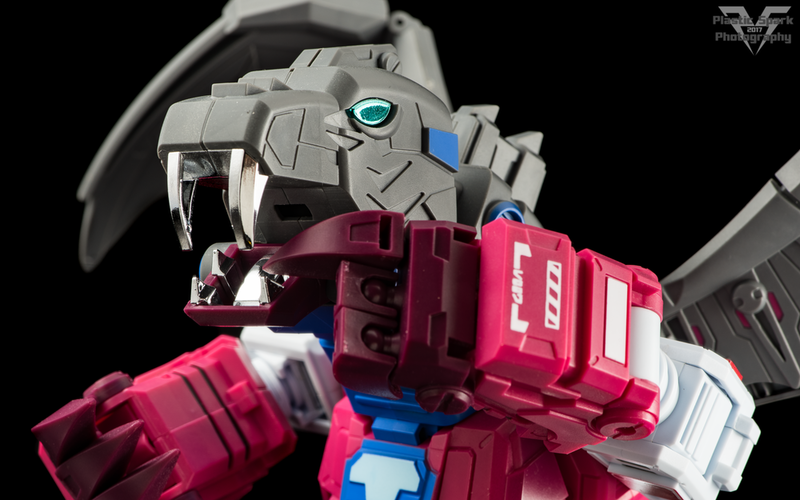 Grotusque is such an oddball character with a weird alt mode that I really didn’t have high expectations, however, Fans Hobby’s ability to turn strange G1 characters into really interesting modern toys is absolutely remarkable and I ended up having a blast messing with this guy. 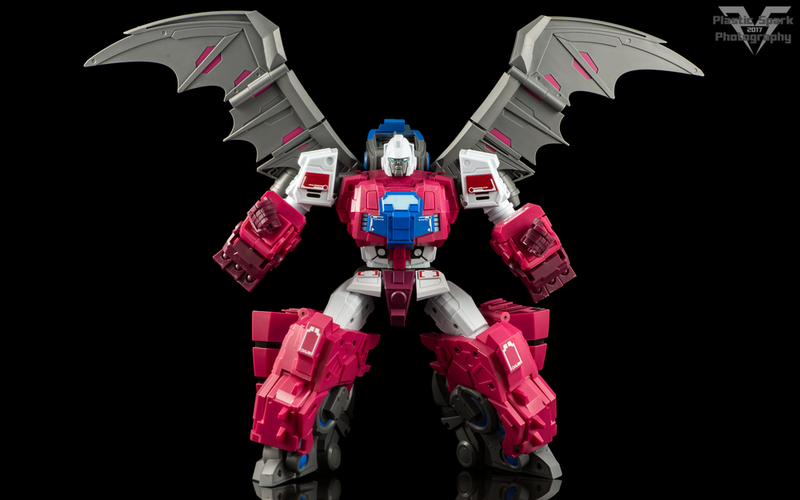 He’s big and heavy with a fun and intuitive transformation that is easy to learn and quick to employ. He’s got a ton of character and looks great with your official or third party Masterpiece collection. There were a couple let downs in the articulation department, mainly the very restricted bot mode knees and the loose ball joints on the alt mode legs, with the latter possibly being a test sample issue and hopefully can be resolved for production. It is also possible that I just got a copy with some loose joints, we all know that happens from time to time even with fully produced figures. I absolutely love the massive articulated wings and despite his nonsense alt mode I actually found him to have a lot of character and personality as a weird dragon tiger thingy. He can be ferocious, he can be goofy, he can even be a bit adorable! 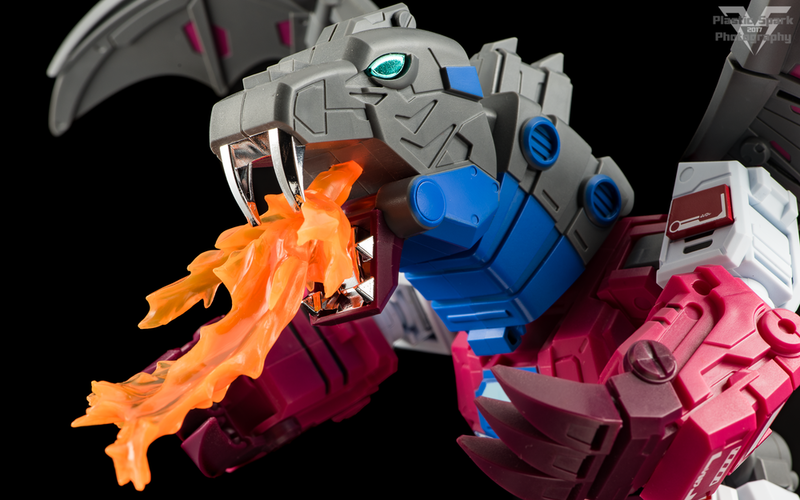 I’m not sure which mode I’m going to display him in as both of them have a lot of cool things going on and I really love the way the dragon mode looks with flames bursting from his mouth! 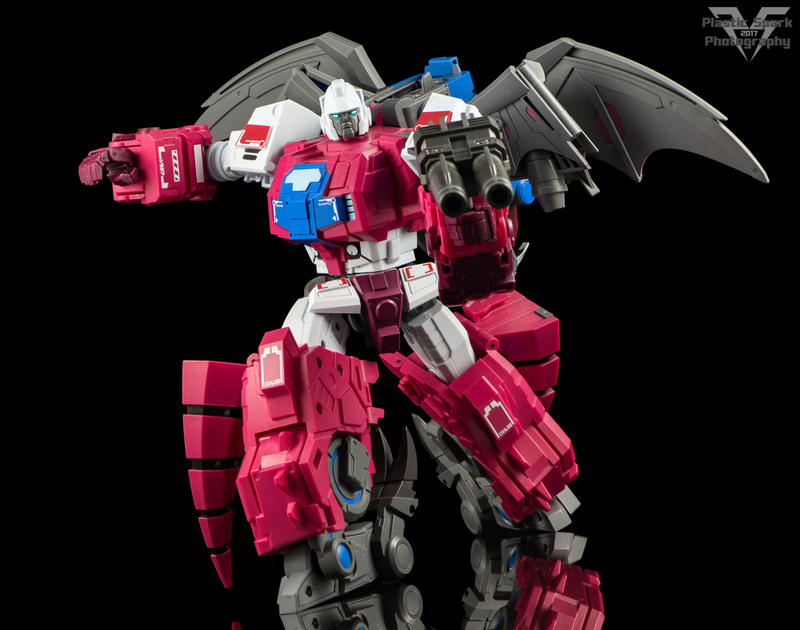 At the end of the day I happily give Flypro my recommendation as a pickup, especially if you are already on board with the Fans Hobby Monsterbots he’s a lovely finish to the trio and with all his included accessories he really fills out the team wonderfully. 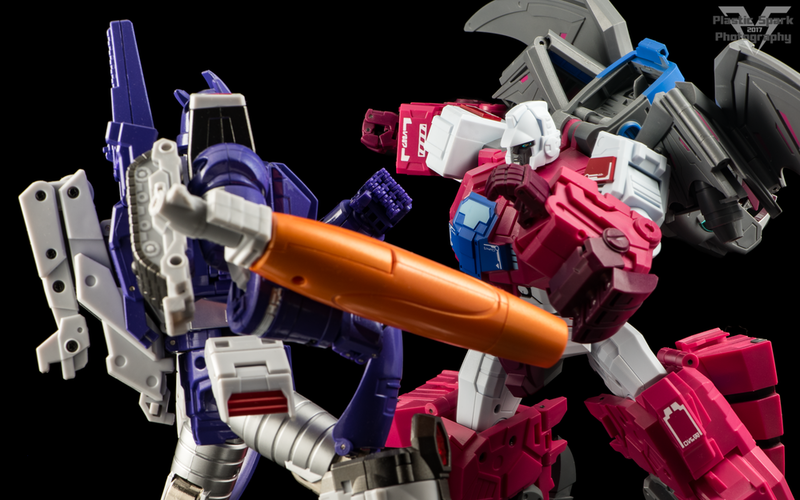 In my opinion Fans Hobby is poised to become one of the top names in the third party marketplace and Flypro is yet another release that is going to help propel them there. I want to thank Fans Hobby for letting me check out Flypro ahead of his retail release. 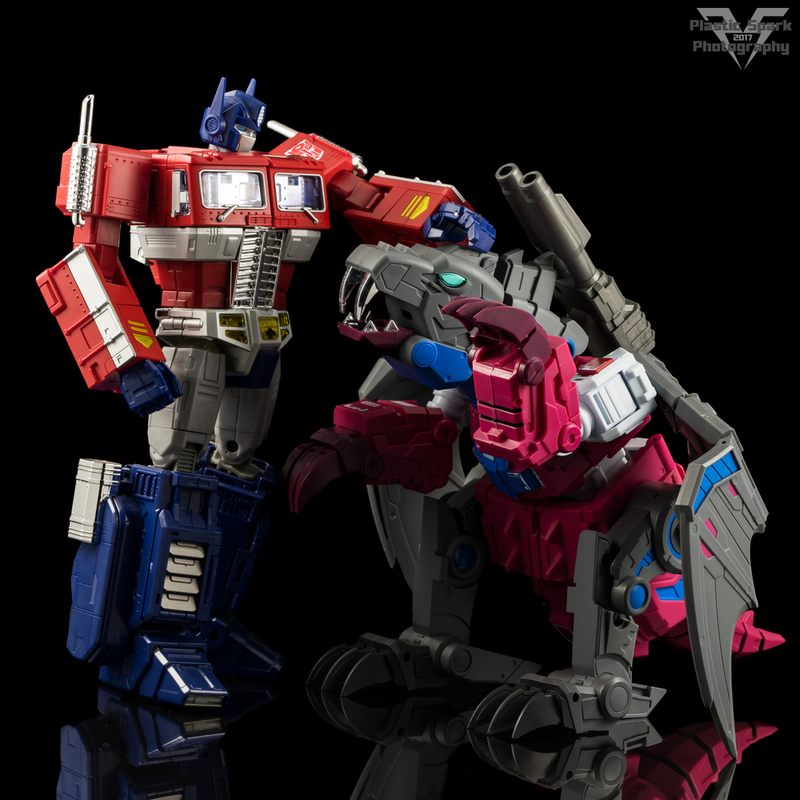 If you enjoyed this article, and especially if you've decided to pick up Flypro because of what I've shown you here, please let Fans Hobby know so that they keep me on and I can continue to bring you photos and reviews of their products! I hope you guys enjoyed the review and photos! Don't forget to check us out on Facebook and if you have any questions, comments, or requests please don't hesitate to leave a comment, message me on Facebook, or email me at plasticsparkphotography@gmail.com. Thanks for taking the time to check this out, see ya next time!